We use a special process of coating every one of our new line of lifts in a very unique slip-resistant finish, it is applied to the runways and the ramps. It makes even the greasiest of situations a real gripping experience. 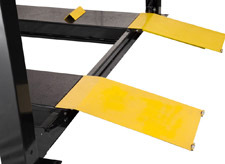 With extra long approach ramps, we make it accessible for your low-profile vehicle. It's just another step to accommodate our group of customers who have low-clearance vehicles. Steel-braided wire, wrapped around a steel core: this is not your typical tire-swing rope. These heavy-duty cables are made to carry the weight of the entire lift, and the load it carries. 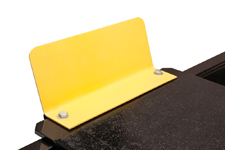 This assembly attaches the cable to the top plate of the post - the anchor to the lift cables. 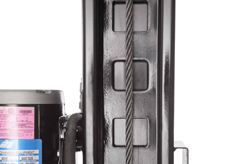 With our new design, we have incorporated heavier gauge steel top plate and heavier gauge columns for rigid durability: even the cable itself has been re-engineered to handle the bold 12,000-lb capacity. 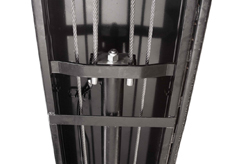 This steel ladder is integrated into the columns with 12 locking positions spaced every 4". Crafted meticulously with heavy-gauged steel. Our new proprietary design aspects- the spacing and the width of the ladder - have greatly reduced stress on all angles. With our upgraded design - you will notice the angle and the durability are ample for any tire-stop. Made with heavy-duty steel; so unlike others you see on the market, this tire stop will not fold under the harshest of conditions. Some may say we are over-doing it; but, we see that as a good thing. 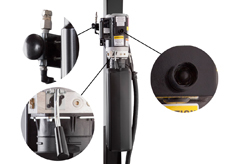 The hydraulic cylinder ties the entire lift together. The welded cylinder body is made from robust steel tubing produced to exceed ASTM specifications. 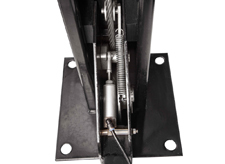 The steel cables are tensed as the cylinder fills - this creates the lifting motion that keeps your 12,000-lb. car up in the air. 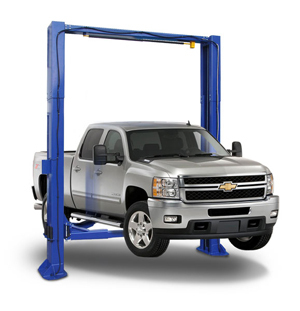 Lifting capacity (*) 12,000 lbs. L - Drive thru Clearance 102"
Note: These specifications are subject to change without notice. It is best to confirm these specifications with a sales representative at the time of purchase.